Pitcher Jimmy Nelson went 2-9 with a 4.93 ERA in 14 appearances and 12 starts with the Brewers last year. There was nothing left for Jimmy Nelson to prove in Triple-A when he received the call to the big leagues from the Milwaukee Brewers last July. Nelson had dominated the Pacific Coast League to the tune of a 10-2 record and a 1.46 ERA, which ended up earning him the league’s pitcher of the year honors despite spending the final four months of the season in the big leagues. But the sailing wasn’t nearly as smooth at the next level, as Nelson went 2-9 with a 4.93 ERA in 14 appearances and 12 starts with the Brewers. "Obviously it’s a tale of two seasons for me," Nelson said. "I had a great first half and I know what I was doing mechanically, physical and mentally and it’s something I want to get back to. "I had the most frustrating and disappointing second half of a season I’ve ever had. And, I’m just going to take the good things I’ve learned here." The circumstances surrounding Nelson’s promotion would have been difficult for a veteran pitcher, let alone a 25-year-old with just 15 2/3 big-league innings under his belt. With fifth starter Marco Estrada struggling, it wasn’t much of a surprise a change was made, but the timing couldn’t have benefited Nelson. 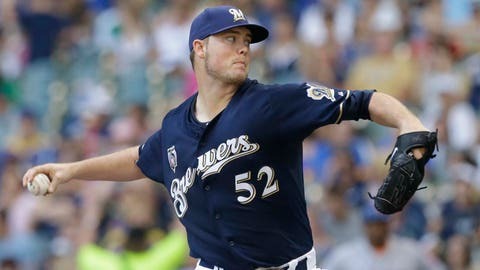 Fair or not, his first start as a member of the starting rotation came against Adam Wainwright and the St. Louis Cardinals with the Brewers having lost six straight games. It was also Milwaukee’s first game after the death of Jean Segura’s infant son rocked the clubhouse. Nelson was tagged for eight runs, six earned on eight hits over 4 1/3 innings as St. Louis ran away with a 10-2 win. "Obviously you are trying to impress people," Nelson said of when he first came up. "It’s human nature. That’s one of the things that we talked about. You just have to get that external stuff out of your mind and focus on executing your pitches." The young right-hander went 2-7 with a 4.38 ERA in 11 starts before being moved to the bullpen in early September. Nelson particularly struggled during a four-start stretch beginning in late August in which he allowed 13 earned runs in 21 2/3 innings, as opponents hit .318 against him. "I didn’t have a lot of walks here, but my command within the zone was off," Nelson said. "I fell behind too many guys. That was the whole half of the season. When you do that, you are going to get hurt. Mix that with a couple of tough breaks and it is a recipe for not doing well." 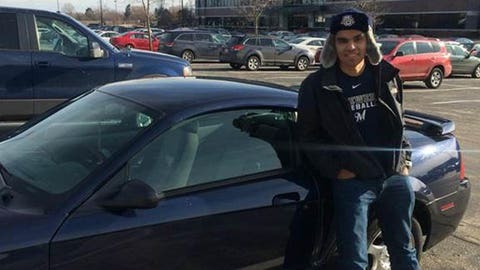 Nelson relied heavily on his top two pitches while with the Brewers, as he threw his fastball 72.7 percent of the time and his slider on 25.1 percent of his total pitches. According to fangraphs.com, opposing batters hit .292 on the 255 fastballs Nelson threw last season. "We were really just trying to establish the strike zone first with my fastball," Nelson said. "Then we were trying to work my best secondary pitch, which is my slider. When I first came up I was struggling to get ahead of guys, so when you struggle with getting ahead of guys it kind of handcuffs you to not being able to throw your third or fourth pitch very often. Guys took advantage of that." The thought with Nelson is that he needs to develop his changeup as a third pitch, especially with the velocity of his fastball and slider being similar. "If you have one, it certainly helps," Brewers manager Ron Roenicke said. "Jimmy is 93 to 95 (mph) with his fastball along with an 88 to 90 slider, and that’s it. There’s nothing soft. It would help him." Although fangraphs.com has Nelson only throwing his changeup on just 2.3 percent of his pitches last year, he insists he threw his third pitch more than people realized. "I’ve actually used it more, sometimes people didn’t even recognize I was using it because it was fouled off or they think it is a slider even though it is a changeup," Nelson said. "I actually used it more the last three or four weeks (of the season). "I think I’m throwing more changeups than people assume. Sometimes it is hard by the naked eye, especially when somebody fouls one off or you spike one in the dirt. That’s hard to tell to from the human eye, even if you are someone within the game watching video. We know what it is, and I know what I have to work on." There’s little question that Nelson belongs in the big leagues, but his ceiling could depend on how he develops his changeup. As of now, Nelson projects to begin next season in Milwaukee’s bullpen. The Brewers return six starting pitchers who made at least 10 starts for the club in 2014. 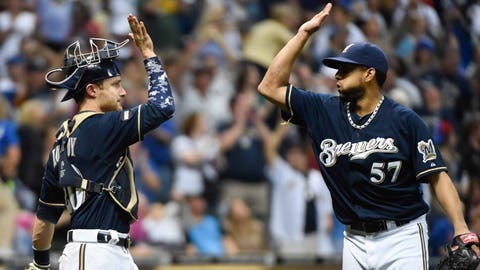 Roenicke indicated at the winter meetings that barring a trade, Mike Fiers would head to spring training with a leg up on Nelson for the fifth spot in the rotation behind Kyle Lohse, Matt Garza, Yovani Gallardo and Wily Peralta. "I think once he starts commanding the ball and getting the ball down, especially in this ballpark where we know it flies well, I think he’s going to do really well," Roenicke said. "He’s strong; he’s going to be able to go deep in game. "But he’s got to get the ball down. You can’t throw 10 sliders and a lot of them leave them up. You’ve got to be pretty consistent down. Fastball, same thing." Despite the struggles he endured adjusting to the big-league level, Nelson is confident he will bounce back with a strong sophomore campaign. "The last four years I’ve struggled at that next level," Nelson said. "I’ve gone through some struggles, but it has helped me to learn and work harder each offseason and the next year I’ve come back and done well. It is just another case of that. It is not anything I haven’t been through. "I’m just going to use that as motivation to go into this offseason and work harder than I did last offseason. I know I’ll come in to spring training ready to go."